Historic New England’s Collections Care Project includes multiple phases of work. During the first phase, staff inventoried and moved roughly 20,000 objects out of one portion of our collections storage facility in Haverhill, Massachusetts. The second phase includes two simultaneous projects: 1.) upgrading the newly cleared storage area by installing compact modular shelving and an additional HVAC system and 2.) cleaning, photographing, and recording data about collection objects. Collections Care Project staff have been toiling away all winter to update records and bring new images to the Collections Access database at HistoricNewEngland.org. 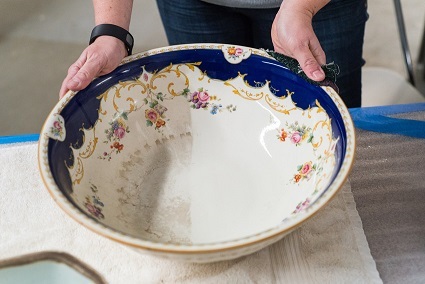 The team has made such progress that the ceramics that were cleaned in November during our first washing day have already been photographed and their records updated. We decided that it was necessary to have a second cleaning day. 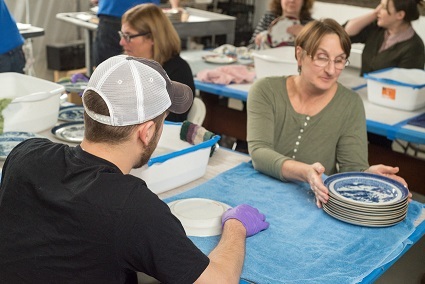 For two days, in the beginning of March, fellow Historic New England staff members representing various parts of the organization–from accounting to visitor experience to fundraising–volunteered to assist with the gentle cleaning of almost 4,000 ceramic and glass objects. These newly cleaned dinner sets, glassware, and decorative glass will make sparkling additions to Collections Access. You can see the dramatic difference the cleaning made! To support the preservation of these collections object and others, please consider a contribution to the Collections and Conservation Fund.